via my phone this morning did not post in its entirety. I’ve had to delete it and go back in to find what I had last written and saved. I was perched on the couch with my trusty little laptop in my lap. I was struggling with my ponderings. What was to be the next day’s post?? Suddenly, a familiar voice caught my attention, pulling me back to the moment. in the movie Forrest Gump. I was not a fan of the movie. I found it just way too silly and bordering on stupid. wasn’t won over by the attempt. and with veterans along with and for their families. veterans, first responders, their families, and those in need. sacrifice each day to provide that freedom and security. we can always do a little more. So now it seems that there is a new documentary coming to PBS about Pearl Harbor. The trailer is narrated by Gary Sinise. 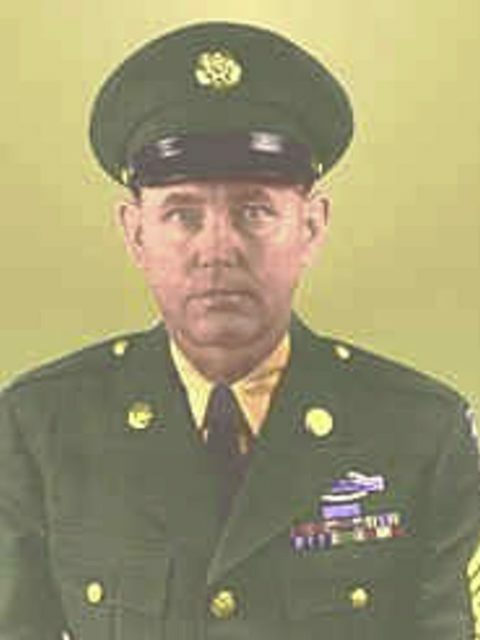 Naval Petty Officer First Class Joe George. by his commanding officer, a 26-year-old Petty Officer George unwittingly turned hero. right in front of the eyes of this young sailor. not until very late in his life did he verbally recall a very visceral nightmare. Fast forward to our current day. 6 men on the USS Arizona on that horrific Sunday, December 7, 1941. PBS will be airing his story. time a medal ceremony had ever taken place at the Memorial. as well as for his actions of bravery and heroism. Navy officials and representatives from the White House. Their goal is to secure a posthumous award for the sailor, Joe George. 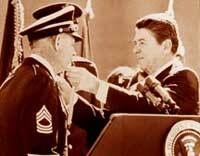 “He should have the Navy Cross,” Stratton told The Arizona Republic last year. 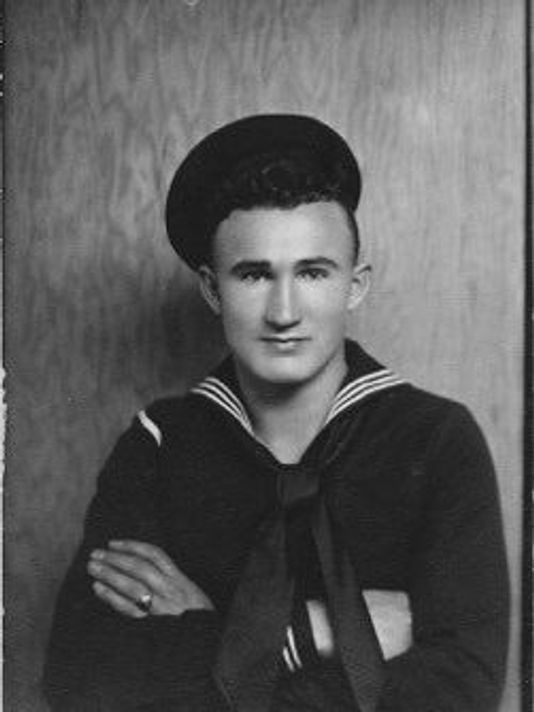 76 years after the very day he risked everything for his fellow sailors. The story is full of the providence of God’s hand. he would not have been on the repair ship, confined to quarters. who perished on that ship that life-changing day in 1941.
death trap to the safety of the repair ship. to slip	away unharmed from the dying Arizona. Stratton and Bruner both acknowledge that George saved much more than 6 men. great-grandchildren that would grow from those 6 men. 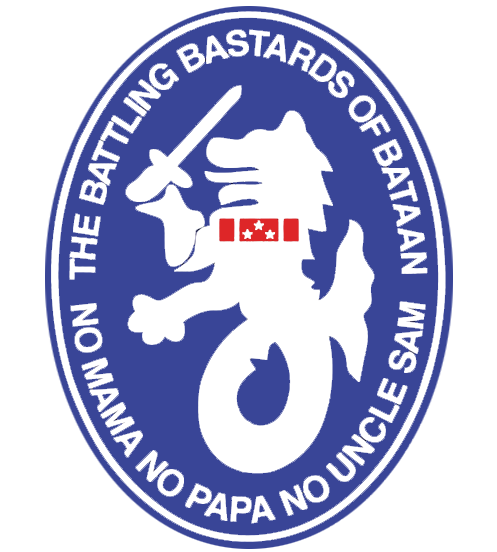 Generations of families now exist because of the bravery of one man. Stories of men like Petty Officer Joe George are so important. They remind us of what we can be. that we are better together then we are separate. We are who we are because of who they were. on our own lives today. If we opt to ignore and forget our past, we are bound to repeat our mistakes. love has no one than this: to lay down one’s life for one’s friends. wondering how in the world you made it through? How you survived and made it out alive? Or more likely that you fared better than those around you? Why was I spared and they weren’t? knowing that someone else should have won? Why was I so fortunate, or so lucky, and why were “they” not? These can be haunting questions for anyone. They can be a life’s curse or a life’s blessing. For there is a great responsibility to whom much is given. life suddenly becomes a tremendous responsibility. is allowed to walk away when others were not. We have seen this in wars and sadly in recent terror attacks and mass shootings. coming to the stalk revelation that he’d been spared while his friends had not. 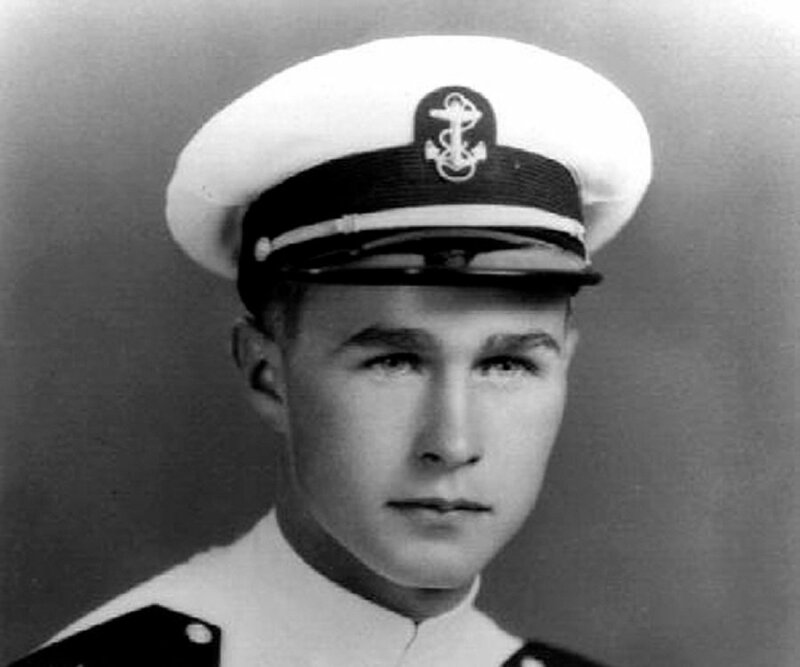 41st president, George H. W. Bush. First, the question was raised by Jon Meacham, the famed author, and presidential historian. He painted the scene vividly as only such a gifted writer could. They were to take out a Japanese radio tower on a tiny Pacific island. took off from the USS San Jacinto to attack a radio tower on Chichijima. As they approached the target, the air was heavy with flack. Smoke filled the cockpit; flames raced across the wings. telling his crew mates to hit the silk. Following protocol, Lieutenant Bush turned the plane so they could bail out. Only then did Bush parachute from the cockpit. as he flew through the sky. and flopped onto a tiny raft. the future 41st President of the United States was alone. Sensing that his men had not made it, he was overcome. He felt the weight of responsibility as a nearly physical burden. Then, at four minutes shy of noon, a submarine emerged to rescue the downed pilot. George Herbert Walker Bush was safe. The story, his story and ours, would go on by God’s grace. and more importantly, his dear friend. remember what they were doing just after their 20th birthday. now standing on the great periphery of adulthood. And yet I wonder as to how many of us know that at 20, one is more child than adult? of Quebec while still living at home and thankfully enjoying his mother’s cooking. His mission was not his own. Any less than, as some might think with such a response to such a question. That somehow, they were simply “allowed” to die while young George was allowed to live. For God uses our lives and our deaths to extend far beyond our simple understanding. It is the ripples that reverberate outward from the dropped stone in the pond. another day all live with a tremendous burden of guilt and a tremendous burden of responsibility. not ask that question…nor not feel the heavy responsibility. He either asked the question audibly or silently…but he asked none the less each and every day. I am reminded of the 1946 Christmas Classic It’s a Wonderful Life. were a part of his own life turn out without a George Bailey to interact with them? own life, by jumping into an icy cold river. Yet God needed to give George a wake-up call. He still needed George to do some important things. for him to do some things. Now I can’t say that all such stories have happy endings. Nor can I say that all spared lives seem to turn out better than imagined. So why George H. W. Bush? is that God will have has His ways. Ways that often frustrate us, but they are His ways and His alone none the less. “His master replied, ‘Well done, good and faithful servant! 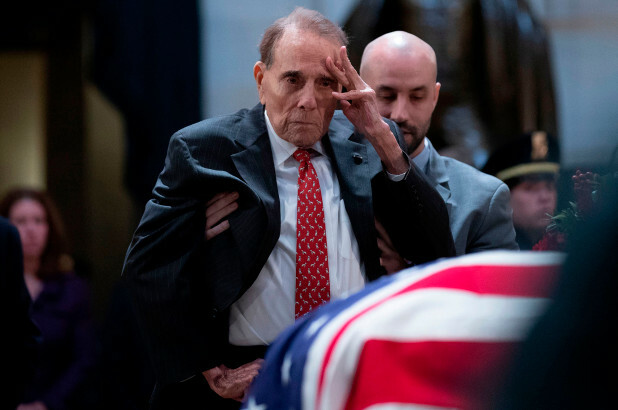 Bob Dole of Kansas being helped to his feet, in order to salute his longtime friend. respects to his fellow veteran and friend. in the back and arm. 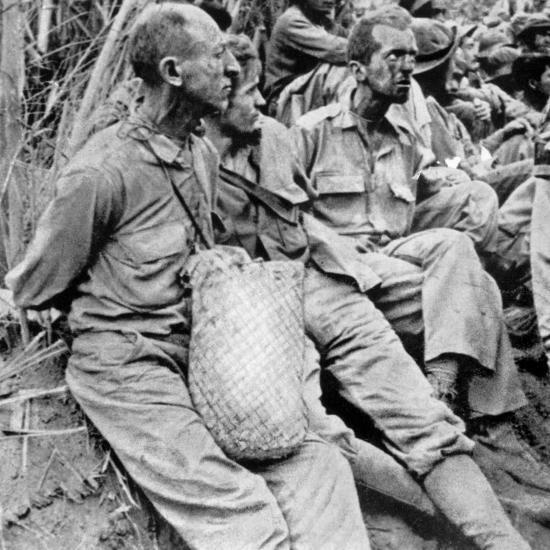 Dole was badly wounded by German machine gun fire, being hit in his upper back and right arm. interrupted by blood clots and a life-threatening infection. administration of streptomycin, which at the time was still an experimental drug. an orthopedist in Chicago who had been working with veterans returning from war. impacts, that more often than not, are unbeknownst to the one who is doing the impacting. I call it the gift of the unknowing. become paramount and even life-changing to the recipient. Bob Dole had his gift giver. And we Americans are better for it. As our nation continues the process of mourning President George H.W. Bush, I wanted to share a story with you that was shared with me this past weekend. It was told to me by a friend who spent his career at the CIA. I can’t reveal his name for obvious reasons but his story is one I wanted to share with you. I think it’s a particularly good lesson for those who lead a team – whether they’re in political, private or military life. My first encounter with 41 was many, many years ago; he was the Director of Central Intelligence. I was a young officer, still not sure what I wanted to be when I grew up. I had spent very little time in the headquarters building – and I actually worked hard not to go there. My supervisor finally cornered me and forced me to go to a mandatory two-week course at headquarters. I had managed to squirm out of it three times but this time I was trapped. I hated the course, didn’t care for the instructor and didn’t warm up to my classmates. They all appeared to know each other, I didn’t know any of them and made little attempt to get to know them. On about the fourth day, I was sitting in the corner, minding my own business and I felt a presence… someone was standing over me, with a tray. “Mind if I join you?” The stranger asked. I looked up, ready to say I was almost done… To my surprise, it was George Bush, then the Director of Central Intelligence. He was all by himself. I stood up and said, “Please, have a seat.” I introduced myself and told him where I worked. He started to introduce himself and I said, I know who you are. He laughed… that laugh of his. He said we had minutes before his people (handlers) would realize he was missing and come find him. We talked about duty and service. I told him about my job and how I was there for a class… I left out the part about me being a jerk and not mixing in. He opined that those classes were a good way to bond with people from different parts of the organization. I believe he sensed I wasn’t doing that because I was eating alone. I was embarrassed. True to his thought, soon after some folks “found” him – although he insisted he wasn’t lost. I invited him to come visit the building I worked in to see what great work my colleagues were doing. He said he would. I went back to the class. Late. I told them why and was bombarded with questions about him. I had an epiphany and became a full participant. He left me with a message I hadn’t understood – not only was I learning from my classmates, but they were also learning from me. A few weeks later a handwritten note found its way to me at my office. He thanked me for our conversation at lunch; it said he had learned a lot! Little did he know the lesson I learned from him. He turned my life and career around. This was the first encounter I had with him… and my favorite George H.W. Bush story. “Remember, the Agency was under seize by the Church and Pike committees. People were angry (I was angry). Morale was low and it wasn’t enjoyable coming into work. He made me feel (probably for the first time) a senior [leader] cared about me and what I thought. “His gift of asking the right questions and listening was amazing. He made me feel what we were doing WAS important and everything was going to be alright. “I had been looking to leave. Of course, I didn’t… but his lessons weren’t lost on me. So why do we celebrate ‘Remembrance’ Sunday? We remember those who died in senseless slaughter. 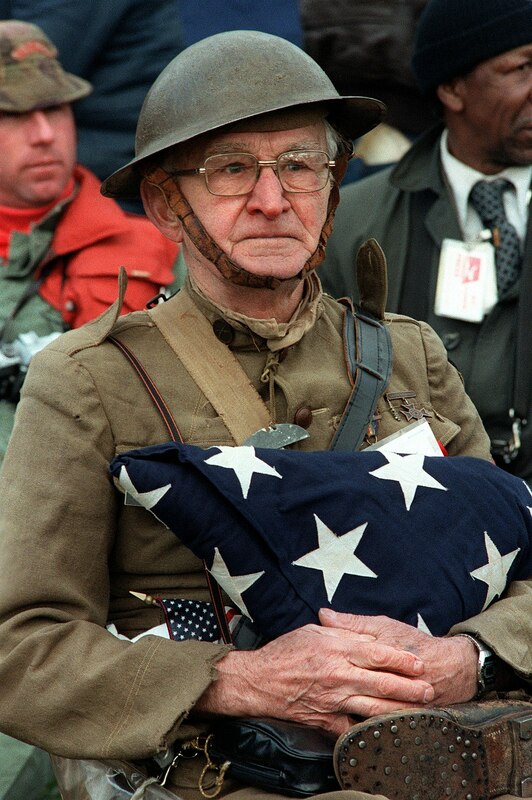 We remember those who fought for our freedom, but we do not celebrate war. November 11th has become the day that we as a nation officially recognize our military personnel. national day of remembrance and recognition. military personnel both former and current. A day to mourn, a day to remember and a day of gratitude. observe as Armistice Day or Remembrance Day. It is the day that will forever mark the ending of World War I.
that the War officially ended. 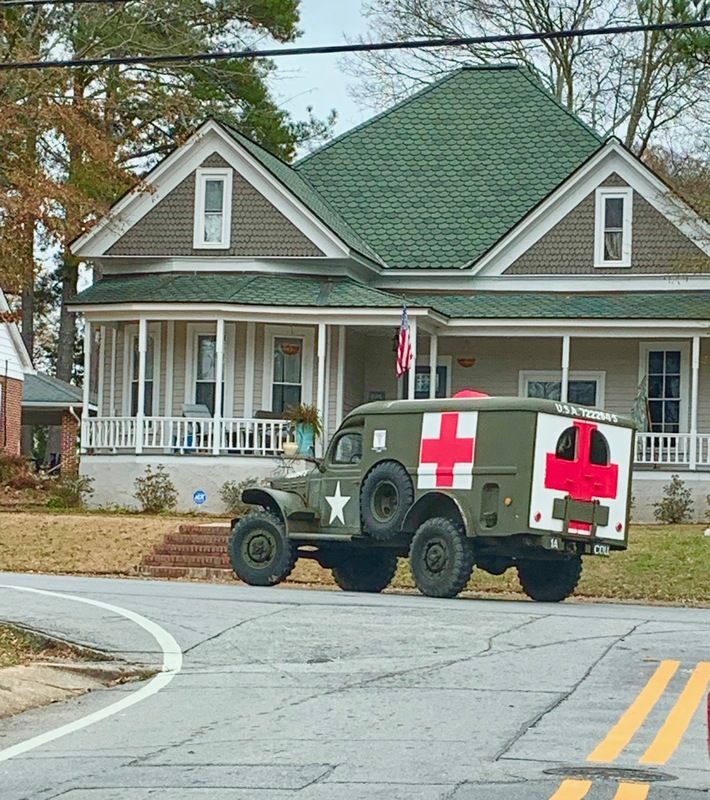 leaving behind some 23 million people wounded. as well as hidden and internal for years to come. Our nation officially changed the name of Armistice Day to Veteran’s day in 1954.
the sacrifices made for our freedoms by generations who went before us. We do not celebrate, but rather we remember and we mourn. We mourn the lives taken far too soon. “It is also fitting to remember our history. one that just happens to suit our current feelings and views. but remembering the Fallen in previous wars is not one of those things.